The Elastic Shoulder Immobilizer, by Jobst, is a device to help secure an arm position for those who need to help heal a shoulder injury. This device will effectively hold in place both the upper and lower arm at two points. 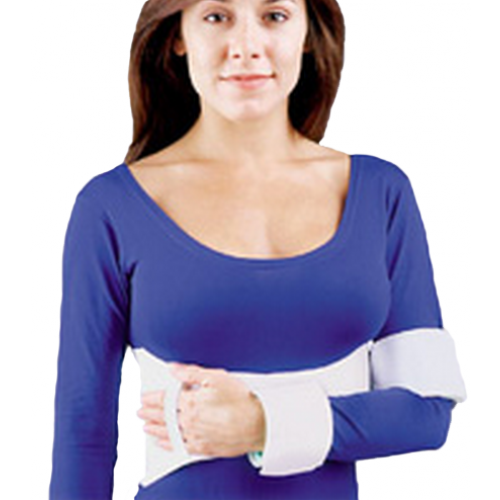 The support is made to be both comfortable and effective for a proper shoulder mend. The Elastic Shoulder Immobilizer is a specific shoulder support that has an arm loop that wraps around the bicep (humerus) to keep the upper arm from rising up. There is another second hold point where the wrist will attach to the waist band with hook and loop fasteners. The arm with the injured shoulder will simply rest downward in an easy 'L' position. The immobilizer will fit either left or right shoulders and comes in four sizes from large adult to youth. Sizing is made simply by measuring the diameter of the person's torso. This immobilizer device is good for those who have an injured rotator cuff, or any shoulder injury where rotating the shoulder can interfere with the normal healing process. The immobilizer will keep the shoulder from rotating so any injury can mend uninterrupted. There are two hold points on the support for both the upper and lower arm. The arm is immobilized with hook and loop attachments. The device will work for both left and right shoulders.